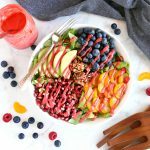 This Orange Berry Pomegranate Superfood Salad is the perfect healthy summer salad made with fresh ingredients and an easy homemade raspberry vinaigrette! Add your mixed greens to a large bowl. Add the orange slices, pomegranate seeds, walnuts, chopped green onions, blueberries, and avocado slices. Drizzle the Easy Healthy Raspberry Vinaigrette Salad Dressing over the top.